The protecting-group-free total synthesis of (+)-clavulatriene A has been achieved. Key features of the synthetic strategy include the development of a novel strategy for the practical synthesis of α-cyperone, and a one-pot palladium-catalyzed reductive desulfonylation and deacetoxylation reaction. 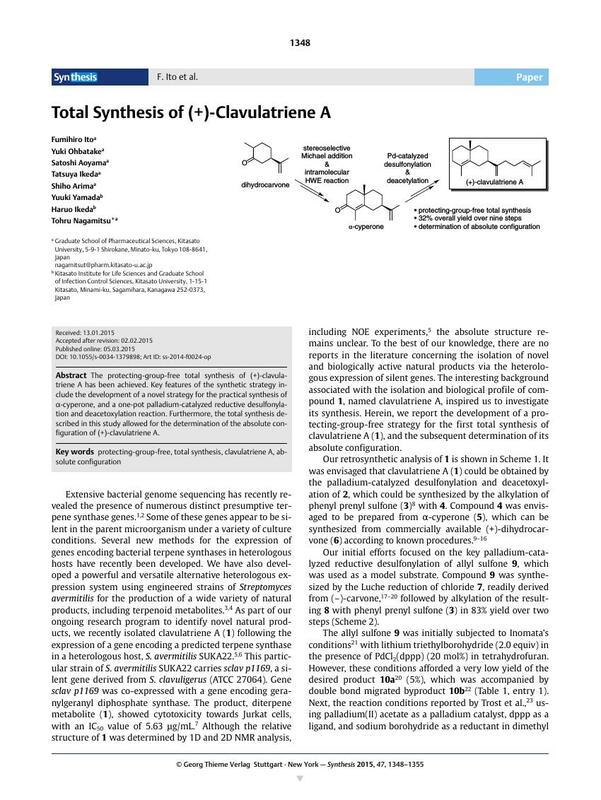 Furthermore, the total synthesis described in this study allowed for the determination of the absolute configuration of (+)-clavulatriene A. Supporting information for this article is available online at http://dx.doi.org/10.1055/s-0034-1379898. 6 Yamada Y., Arima S., Nagamitsu T., Johmoto K., Uekusa H., Eguchi T., Shin’ya K., Cane D. E., Ikeda H.; J. Antibiot. ; DOI:10.1038/ja.2014.171. 22 The structure of the double bond migrated byproduct 10b was proposed by 1H NMR, in which new olefinic protons and methyl groups in the isopropyl group were observed as a doublet peak. For the migration of an olefin in a palladium-catalyzed reductive desulfonylation, see: ref. 21.